Modern day travel involves more than just cars. On a given day, a stretch of roadway might see travelers on bicycles, motorcycles, trucks, roller skates, and their own two feet. Motorized scooters are another form of travel and, like many other travelers, operators are vulnerable to reckless drivers. When a driver puts a rider at undue risk and harms the more vulnerable traveler, our Oakland scooter accident lawyer can help recover monetary compensation for the injured party. Motor scooter accidents are a real danger and the mix of prevention and representation are key to reducing the threat. A 50 year-old Los Altos man lost his life on Friday following a scooter crash detailed in the San Jose Mercury News. Brian David Lazara was hit by two cars while riding a motorized scooter in Sunnyvale. The crash occurred just before 9 A.M. at the intersection of Central Expressway and Mary Avenue. Emergency responders arrived to find Lazara injured and lying in the roadway. They performed CPR and took him to Stanford Hospital’s trauma center where personnel declared him dead. Both auto drivers are cooperating with the ongoing investigation. Scooter accidents are a growing danger, in part because people have turned to motorized scooters as one way to save on the rising costs of transportation. In 2005, the Consumer Product Safety Commission (“CPSC”) looked at the issue of scooter accidents (see summary page dated 2007 and the study report itself from 2005). They concluded that, from July 1, 2003 through June 30, 2004 10,015 emergency room visits were related to powered scooters. In two-thirds of the emergency room visits in the CPSC study, the injured party was 15 years old or younger. In 2011, a group of researchers looked at what makes the difference between a minor scooter accident and a severe crash. 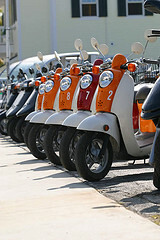 Focusing on Florida as a case study and using the terms “moped” and “scooter” interchangeably, the Journal of Trauma article identified 5,660 moped accidents between 2002 and 2008. Eighteen percent of the crashes caused severe injury or death, with impairment due to alcohol or drugs doubling the risk of such serious outcomes. Speed and nighttime hours also increased the risk of a tragic outcome. Other risk factors associated with an increase in severe outcomes included unpaved roads, poor lighting, high speed limits, and roads with 4 or more traffic lanes. Notably, the CPSC study referenced previously found approximately 20% of the accidents in their study involved some problem with the scooter itself such as brake failure, loose wheels, or even a handle bar coming off. We encourage all scooter riders to wear safety gear, including a helmet, and to pay close attention to their surroundings. Sometimes it is best to assume the worst; assume drivers do not see you, leaving room to let you can react to a potentially dangerous situation. Still, a careless driver leaves even the most careful scooter operator vulnerable to a serious injury or even death. If a negligent driver caused a power scooter accident that left you or a family member injured, our Northern California scooter accident law firm can help. Remember, the rules of comparative negligence mean you may be entitled to money damages even if your own actions contributed to the incident.